In this week’s Two Minute Tuesday, we’re going to walk through the process of creating a confidential or “blinded” copy of a resume in your system so that it’s safe for sending to third-parties. Note: One piece of this video is slightly out of date due to recent updates. 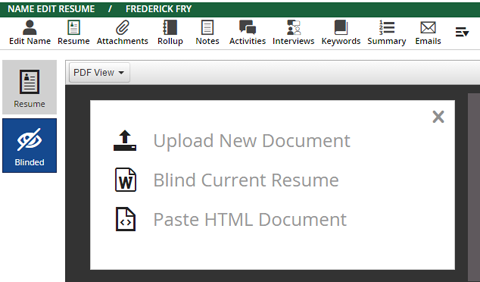 Rather than a ‘pencil’ icon when no blinded resume is present, you’ll see the option to upload or paste a blinded resume in addition to blinding the one on file as shown in the video. We’re back for another Two Minute Tuesday, Main Sequence’s series of short videos with tips, tricks, and tutorials to make you a more powerful user of PCRecruiter. This week, we’re looking at creating a confidential or ‘blinded’ resume in PCRecruiter, which is a common task to perform before sending a candidate’s information to a potential hiring authority.We’re going to start by quickly parsing a resume into the system as a new candidate record. We’ll click the icon at the upper right, choose ‘Name’, and then choose ‘Parse from Resume’. Clicking ‘Start’ launches the ‘Add Resume’ utility. Now we click ‘Open’ and select a resume. The system parses the contact info from the resume header, and everything looks good, so we click ‘Save’ to store the new candidate. Now, we want to create a blinded copy of the document that’s safe for distribution to a client. On the name record, we’ll click ‘Resume’ to view the stored document. The ‘blinded’ option appears in the side bar. At the start, there is no blinded resume and we simply see a blank document. To start creating the confidential version, we mouse into the document and click on the gray pencil. This will launch whatever appropriate document editing software is installed on my machine – in this case MS Word – with a copy of the resume. Now, we simply go through the document, removing any identifiable information or details. When all of the necessary edits have been completed, I just close the editing software and save, which causes the system to upload the document back to the PCRecruiter database. Clicking the resume area to reload shows us that the new blind copy has been stored. Once I have this blinded resume on file, it becomes available as an option whenever I’m sending resumes out of the database. For example, when I select names to email to a hiring contact in the pipeline, the Blinded resume appears as an option in my list of attachable files. When both a complete and blinded copy of the resume are present, PCR will default to selecting the confidential version. If you get a completely new resume from the candidate at a later date, you may need to update the blinded resume as well. If you don’t want to edit the current blinded resume, you can use the ‘delete’ option in the actions menu to remove the blinded resume from the record, and then repeat the blinding process with the new resume. It’s also worth noting that the original resume on file is the only one that’s used for keyword searches. The blinded resume content is purely for use as a confidential copy to share with third parties, and doesn’t affect the way a record is indexed by PCRecruiter’s internal search engine.